As everyone knows, The Force Awakens came out in theaters in the December 2015. My youngest brother is a big fan of the whole franchise (under my guidance of course). He approached me as soon as he discovered the date of release and told me that he wanted to dress up as a character to go see the film. He decided on Luke, mostly because he has similar hair and so I made him the outfit from the Jedi Returns. 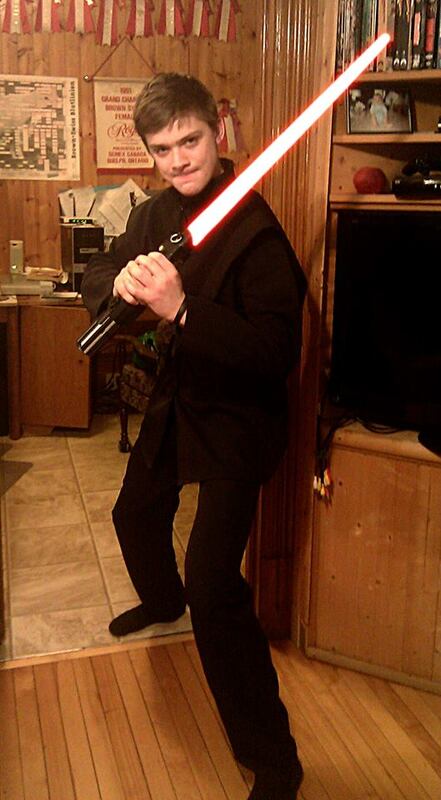 It actually makes for a very good Sith costume as well! Shirt - The shirt was simple to construct and consisted of one back panel, two front panels, the sleeves and the mandarin collar. I altered a jedi tunic pattern so that the shirt's neckline was circular and it crossed over on front to button up on one side. Vest - I used a ninja armour pattern for the vest. The making of the vest wasn't all that exciting until I started placing it with the rest of the costume. The vest stays in place with ties on the side and velcro fasteners on the shoulders. Belt - The belt is a modified obi; the majority of the belt is comprised of the ties which are attached to the rounded ends of a rounded rectangle. It ties by wrapping the rectangle around the waist and bringing the ties from the back to the front to make a knot. Pants - I drafted the pants pattern myself using a pyjama pants tutorial that I have used countless time now. I did make a mistake with the first pattern so I did have to re-make them once. They are held up by an elastic at the waist and are loose throughout the leg.